Over the past decade, purchasing processes have been entirely transformed. 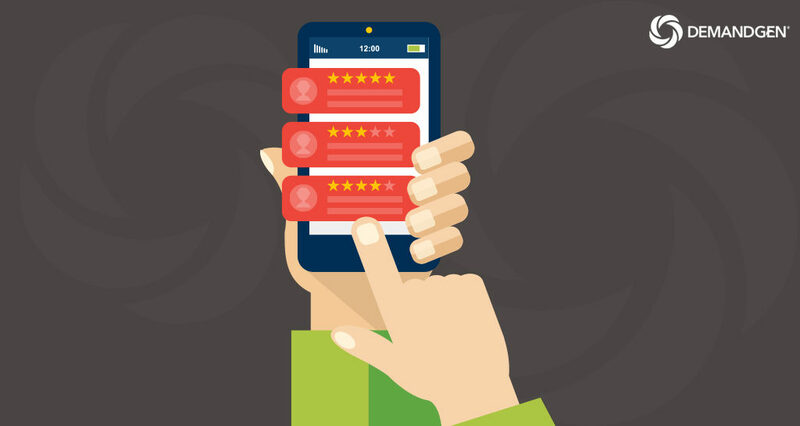 We now live in an era where customer reviews carry more weight than traditional marketing campaigns or sales strategies when it comes to influencing purchase decisions. As the digital age evolved, it brought about new B2C channels and platforms for consumers to easily share their feedback relating to specific products and services. Companies like Amazon began to feature reviews alongside specific products, and third-party B2C platforms like Yelp, Angie’s List, and TripAdvisor formed to deliver reviews of restaurants, local businesses, and travel destinations. Even social media proved to be a perfect channel for both those willing to share their buying experiences and those looking for purchase recommendations from peers. Naturally, this concept of capitalizing on customer reviews and word-of-mouth marketing has slowly made its way into the world of B2B. While white papers highlighting product features and 30-minute demos with sales reps may have been the primary driver of closed deals in the past, those in the buyer’s journey today are more likely to be impacted by the voice of the customer. B2B companies that are taking advantage of review sites are seeing massive amounts of success. A study by G2 Crowd found that 92% of buyers are more likely to purchase a product or service after reading a trusted review, and research from the Spiegel Research Center reveals that online reviews can increase a company’s conversion rates by as much as 270%. Trusted business reviews influence potential buyers at every stage of their journey, from awareness to consideration and up until they make their final purchase decision. As a prospect evaluates your company’s product or service, they will consider the experiences of others to determine if your solutions will meet their needs, if your onboarding process and customer support will deliver upon expectations, and whether or not the investment will be worth the time and effort. Over 70% of people trust recommendations from people they don’t even know. By putting authentic reviews in front of potential buyers, marketers and salespeople can help shape the narrative around their offerings. Looking at the marketing technology space alone, someone interested in implementing a new tool into their MarTech stack is faced with over 5,000 vendors to choose from. The amount of reviews and ratings a company has can be used to filter through the thousands of solutions that are available. In other words, your company’s presence on a third-party review site greatly improves your chances of standing out among the competition and may even be the only reason you get discovered. After seeing how business reviews can be used to build trust and credibility, increase brand awareness, and establish a stronger market presence, there’s no reason not to begin building a customer review strategy. Start by determining which B2B customer and peer review sites are most likely to send new customers your way. G2 Crowd, Capterra, and TrustRadius are some of the more popular B2B review sites that people go to when looking for or writing reviews. Once you claim your company page and/or create a company profile, you can shift your focus toward collecting reviews. If you offer great solutions and consistently provide positive customer experiences, then gathering reviews from your customer base should be easy! Send out an email or have your customer success team bring up the topic during their next call or in-person conversation. Another great time to ask for clients and customers to speak on behalf of your company is at the completion of a major project or during an offboarding process. Be sure to outline why you are asking for the review and direct them to where they should submit their feedback. Having a customer review strategy in place will be an ongoing process. Buyers feel most confident when companies have a minimum of 11-50 reviews and prefer reviews that have been written within the last 6 months. Negative reviews are not always bad. People are more likely to trust a brand with reviews range from 4.0-4.7 and remain wary of any brands that have a perfect 5 stars. Having a less-than-perfect rating will actually help build credibility and make your brand appear more human. Only pursue honest and authentic reviews. Potential customers will know whether or not your reviews are legitimate. It’s also important to consider that a customer review strategy isn’t just about collecting as many reviews as possible, but also leveraging the information you receive to your advantage. Use the feedback to improve any problem areas surrounding your product or service. Written reviews can also be repurposed into marketing and sales collateral such as client testimonials or case studies, sales presentations, and more. So, go get started! You’ll find that harnessing the voice of your customer can lead you to a new, low-cost marketing channel that will instill confidence in your brand, reinforce purchase decisions, and provide valuable feedback for your product and customer service teams. As a Marketing Associate at DemandGen, Justin Chormicle supports many of the demand generation efforts that help connect tomorrow’s Marketing Heroes with the support and knowledge they need to get started on their digital marketing journey.